OSWEGO –There will be more than stars twinkling at St. Luke’s annual “Bundle of Bucks” Charity Raffle – thanks to a generous donation of a beautiful necklace and gift certificate by JP Jeweler’s in Oswego. The items are among a “bundle full” of fabulous prizes that will be awarded during the big raffle drawing party May 4 from 1 to 4 p.m. at the Oswego Elks Lodge. 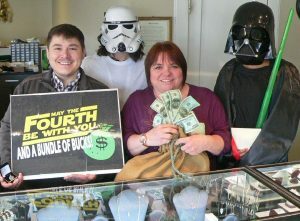 Pictured (left to right) is JP Jeweler’s co-owner Kevin Hill; with “Bundle of Bucks” organizer Diane Garcia, along with two interested lookers-on: “May The Fourth Be With You”! Raffle tickets are still available for the big $25,000 drawing. Every raffle ticket is eligible for all fifteen raffle cash prize drawings, with a grand prize of $10,000 going to a lucky winner. Each raffle ticket admits two adults to the “Bundle of Bucks” raffle drawing party. To be part of the raffle stop at either St. Luke Health Services, Bishop’s Commons or St. Francis Commons in Oswego to purchase tickets directly, or download a ticket application from the St. Luke website – www.stlukehs.com. The event promises to be another afternoon of fun, fantastic door prize give-a-ways, food and beverages, live music by Jimmy D and The Jury and of course all the excitement leading up to the big raffle drawing for cash prizes!